The Intrepid Sea, Air and Space Museum has so many cool things to do and see, that we highly recommend it, especially if you have kids interested in space exploration. Besides the regular exhibits, there are always special events, lectures and stargazing nights that are sure to make any "space geek" (both young and old) excited beyond words. The Intrepid Aircraft Carrier - Of course, the most amazing thing about the Intrepid Sea, Air & Space Museum is that it's not housed in some dusty old building. The museum itself is a real live World War II era U.S. Navy Aircraft Carrier. On the Gallery Deck, you'll get to see the combat information Center (CIC), The squadron ready room, and the berths where the Marines that served on Intrepid lived. On the Third Deck you'll get to see the mess hall and area where enlisted personnel slept. 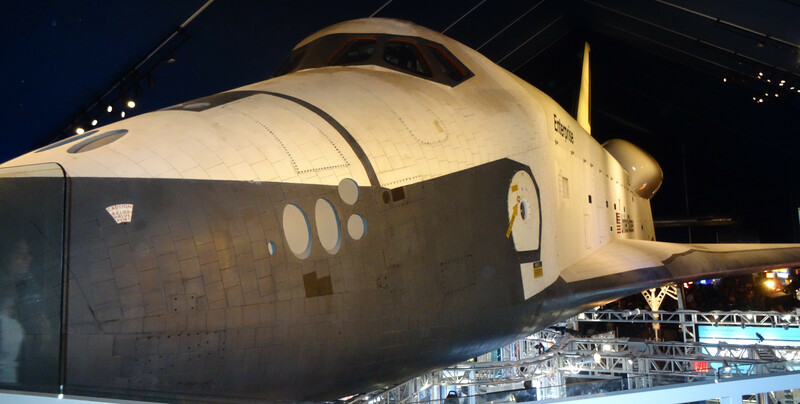 The Enterprise Space Shuttle - The highlight to your trip to the Intrepid no doubt will be your visit to the Space Shuttle Pavilion where you get to see NASA's Space Shuttle Enterprise. Though Enterprise has never gone to space, it's a terrific representation of NASA's Space Shuttle program's five Orbiters that have. The shuttle program ran from April 12, 1981 until July 22, 2011 when Atlantis returned to Earth after STS-135, which was the last shuttle mission. The Aircraft Collection - On the deck of the Intrepid, you'll get an opportunity to see examples of some of the most famous aircraft in aviation history such as an A-12 Blackbird, a Phantom Fighter, a Soviet MiG 17 and the Concord. It's an amazing experience, especially if you're an aviation buff. The Submarine Growler - The Growler is a decommission guided missile submarine and you can walk the halls of the vessel and see the cramp quarters those who served on her experienced. You'll get to see the mess hall, the torpedo room and more. Guided Tours - There are several guided tours you can take so you can learn many interesting facts about the Intrepid, the Enterprise, the Growler and all the aircraft on the Intrepid. The Intrepid Sea, Air and Space Museum a very interesting place to explore, and you'll find yourself learning fascinating things all while having a lot of fun! Daily - 10:00 a.m. - 5:00 p.m.
You can take the A, C, E, N, R, S, 1, 2, 3, 7 train to 42nd St. and then walk or take the M-42 West Bus toward the Hudson River (12th Ave). Take the M34 Bus that runs on 34th St., the M42 Bus on 42nd St., or M-50 that runs on 49th St. to 12th Ave. and Hudson River. 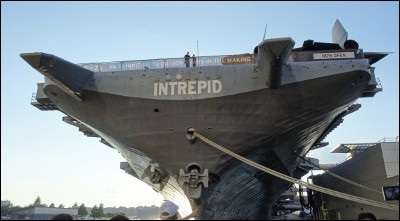 The Intrepid is the 4th Navy vessel of that name and was first launched in launched on April 26, 1943. She participated in several major World War II battles and post WWII Mercury Astronaut rescue missions and Soviet submarine surveillance.